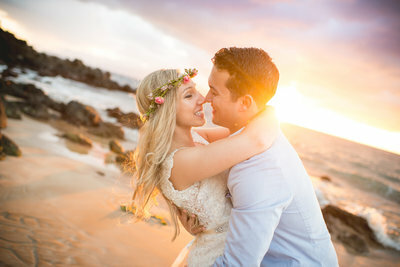 Even though it rained at Cara and Dimitar’s Maui Destination Wedding and they had to move their ceremony inside, they were still really happy and in love! Luckily, the rain cleared just long enough for these newlyweds to pop outside and check out this epic sunset before returning to celebrate at their reception with their wedding guests. The love and excitement in the air were almost tangible, making this a day to remember! Cara was a stunning bride in an elegant wedding gown, and we especially love the way she wore her hair. With loose curls pulled half back and light pink spray roses with baby’s breath thoughtfully placed, this is one of our favorite bridal hairstyles to date! 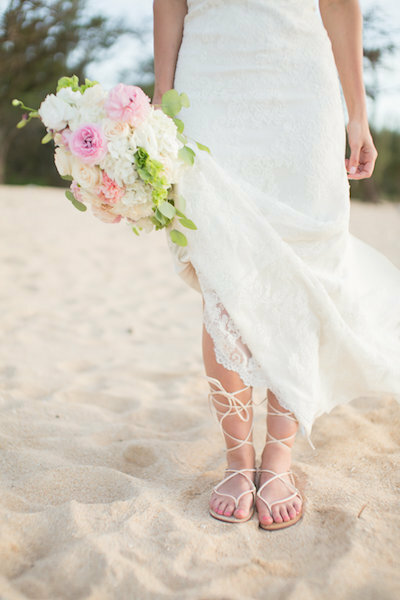 Plus check out how perfect her Custom Bouquet by Dellables was for this Maui Destination Wedding. One of our favorite details was made all the more special by the story that goes with it; a couple months after these two started dating, Dimitar bought Cara blue shoes she never wore, little did she know they would end up being her something blue and her wedding shoes on her special day. So sweet! We are obsessed with this couple’s love story and are confident they will have a life full of love and laughter. 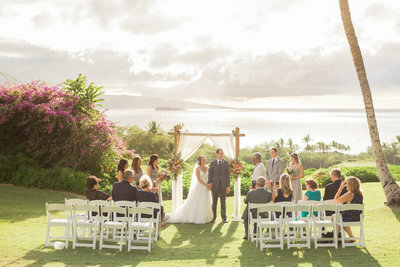 Thank you, Cara and Dimitar, for letting the Simple Maui Wedding team participate in celebrating your new marriage! Congratulations and Warm Aloha!